Everyone understands that being engaged in your work, life, family and self is key to a happy life. Nobody thinks that you’ll be perfectly fulfilled without a balance – everyone needs to be happy with their family, but you also need outside interests. Everyone needs to feel like they are a contributing member of both a family and a society. It’s not an easy balance for most of us. I struggle with it – I make good money but I still have less free time during the week than I’d like. Bubelah struggles with it, too – she spends a lot of time devoted to child care now that we have two kids, although having my son in preschool has helped. This imbalance is something many single-income families face, because the roles end up being so sharply divided. Yet at the same time most of us feel that we have to struggle with work/life balance. You will not gain financial independence quickly as an employee. Employees are performing a straight-up swap of their time for money; the possibility to increase the money-to-time ratio is at the employer’s discretion, never the employee’s. If you want to be rich and therefore gain some measure of independence in your financial choices – and therefore in your life, you have to start a business or buy real estate or become a person who understands the market in its current sickly state. Alternative income is key to building wealth. But I am not just talking about figuring out a way to get rich. Why is it that we view work/life balance as a struggle, a conflict to be resolved? I worry about it more than I worry about most things in my life – and I’m a worrier by nature – but I am trying increasingly to focus not so much on work/life balance but on how to move towards integrating work and life together in the future. I don’t think balance is truly possible. If you work a long commute away from home, most of your waking time is spent away from “life.” If you spend all of your time at home, it’s hard to develop your career or interests. Again, figuring out a way to get away from selling your time for money is key. The key is not to strive for balance, but to find work you enjoy and can integrate with your “life,” instead of working hard then retiring early, or thinking that working an eight-hour day with a three-hour commute and having a few hours at home is balance. Figuring out a way to do it in a blended way is better than trying to figure out a balanced way – because if you sell your time for money, there will never be balance. Hmm. I more or less agree, I think that you want to get to a position where what you do all day is more or less what you enjoy. Seriously, there’s almost no chance that I’m going to be able to stop selling my time for another 20, 30 or 40 years. It just isn’t going to happen. I may as well stop trying to balance work and life, and start treating work as part of my life and do something that I enjoy, with interesting people. You tried that this past spring with little success. Unless you can come up with a new model, working at home and moving easily between selling your time and doing personal things doesn’t sound like it comes easily to you. In the past, your answer has been to develop income-producing revenue streams that don’t require a lot of attention on your part. Does this post mean that you’re rethinking that model, or reaffirming it? I confess that working at home and moving easily between business and personal activities does come more easily to me, although I likely still suffer from working too many hours in total. It’s always been the technologist’s penultimate high to be the hero by solving difficult problems, but I was doing it so much that I finally had to cut that cord recently and make a job change. More money, too 🙂 . I’m not selling my time for money. I’m doing things that are interesting to me, and getting paid to do so. True I don’t love every minute of work, but I can’t imagine there is anything that I would love 100%. I think a long commute does not help because you are “wasting” that time traveling to and from work that you can be with your family. Even though I am using audio books on my commute to learn new things, that is only trying to make the best of the situation. That is why I am really excited that in two weeks I am starting my new job that is ten minutes away from my house. Now it feels like I am still within the sphere of my family even though I am gone most of the day. Seriously, if my job ever offer to let me work only 6 hours a day, pro-rated pay, I would jump all over it. You’ve hit the nail on the head with this post. There’s no such thing as balancing life and work because a balance would have some equality to it and that’s just not the case. Blending is a better concept as you’ve shared. My employee friends sometimes take digs at me because I often work on weekend mornings. What they don’t get is this. When your work is a delight it doesn’t matter when you do it. Eagerness to work joyfully is something that we all ought to experience. I like the word “blended” over “balance.” Everyone needs to find the right “blend” that suits his or her life. Maybe you don’t mind a 3-hour round-trip commute if you like the job and what it promises you in the long run, and maybe if you commute by train, you can get some work done on the commute as well. Maybe being gone 12-14 hours a day from home is not a big deal if things at home can take care of themselves. But if most of your life revolves around your home area, as mine does, you probably need to be physically closer to home. That’s what I experienced last year when I traded a 3-hour round-trip commute for a job 5 miles from home. For me, being away from home only 9 hours a day is a heckuva lot better than 12-13. Great post. This struggle is very real to me as well, and part of the reason I started my blog. It is so easy to get caught up in the should-be’s, could-be’s of life that you spend more time day dreaming about the future or regretting the past instead of living today. Whatever your life looks like, whatever the balance between work and family and pleasure, that is life. Life isn’t one extreme or the other, but the blend of them all and our job is to blend them the best we can. The key becomes enjoying what you do, working hard, and starting to carve out margin for the things you’ve always dreamed about. You make some good points. However, personally I feel a drive to develop my career. Yes, I work long hours, but I don’t suffer from it. I used to own my own business and work independently as a consultant. I hated it. Many folks in the PF blogging sphere treat being an employee as some sort of disease that needs to be cured – some days, I share the same feeling. Most days, I like my work. BTW – the long commute thing is something that can be addressed. I agree with the general sentiment that, if you have the choice, choose something you enjoy over something that is “just a job” that might allow you to retire earlier. But I also think that this is “nice work if you can get it,” and mostly a realistic option only for those who are already middle to upper class. For large segements of the population selling your time for money is really the only option available. It is important to remember that balance does not need to mean equal. 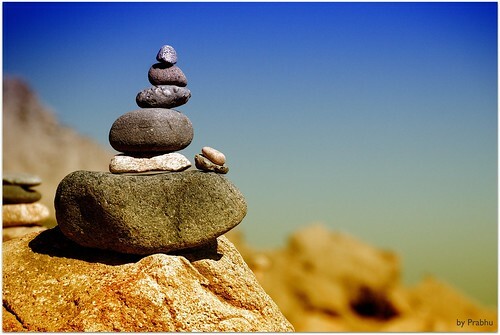 Rather, balance is finding a way to be successful in both work and the rest of your life. This can change as your career changes. Certainly most people spend too much time doing career related activities and neglect the parts of life that mean the most in the long-term. 1. Find a job you love! 2. Find a job with flexibility – prove yourself and your ability to work well and then arrange flexible work arrangements such as the ability to work at home (I love this part of Tim Ferris’ “Four Hour Work Week”). 3. Work to develop forms of passive or residual income that allow you to work less while still earning an income. For many a home based business is the idea choice. It used to be, getting a good job, working well at it and providing for a family was enough. Now, you not only “have” to find the job that pushes all your pleasure buttons, but it must be in “harmony” with everything you do in life and if you’re not looking for this nirvana, well, there simply must be something wrong with you. It’s almost like the next phase rebellion against the gathering of material goods in the finding of your perfect “balance”. Sadly, the problem is, if you feel content at having achieved this balance (or blending since I like that term as well), it’s likely you’ve taken enough time to get there that you can’t shake the habit of seeking it and likely not be content for long at all. I strongly disagree with you. You can find the balance at any point of your life. You don’t have to take a long time. Find joy in the things you do, be thankful for what you have and continue to do your best. The balance will change as your life changes, but if you have your values right it will be easier to find balance in each stage of life, even if the balance looks very different. A good way to find the right balanace is to look at what gives you and your family happiness versus what makes you comfortable. There is no black and white answer, only shades of grey. I recently wrote about a work specific post, discussing 21 signs why you are losing interest in your job and one more that I would add is around what you have discussed here. Great thoughts.. There is always worries about how to make time at home after all the work. It is mainly about managing time efficiently. The outsourcing has been a key to many especially in US to achieve work-life balance. Hiring a virtual assistant is a key to make your life easy. Have a look at http://www.outsorcerer.com/blog to get further details about Virtual Assistance. For any professional it is must to keep the balance in his working life to perform professional and social duties with equal perfection. It is also true that every one of us is facing tough competition in the trade so we can’t cut short to-do list of the day. I think outsourcing is the best way for the professionals to sustain balance in their working life. OutSorcerer.com may also be a good source to know more ways for maintaining and sustaining work life balance. Whenever I think of work life balance, it is the life that gets a hit. I've heard of some organizations adopted a practice of parcel delivery . Incase you cannot greet and gift your near and dear ones, organizations where you work for take the expense and burden of parcel delivery on your behalf. Though in no way a compromise for self greetings but certainly some care to personal life by organizations. Taking proper diet too helps work life balance. Though you cannot compromise on working hours with a proper diet but it helps you stay healthy and active which in turn is beneficial both in work and family life. I believe that 21hours would be good as the basic working week as opposed to the massive 40hours (or a lot more). It is too much and cannot be sustained for a lifetime. People are not machines. Some would say this is unrealistic but nevertheless, flexibility is needed for the knackered and stressed out worker. It is extremely important and valued by an employee more than anything. If flexibility and empathy are given to the employee by the employer – then stress related absence could be reduced for a start. The employee will give more. There are many resources for a sustainable working practice. This includes elements of occupational health, counseling, financial and careers advice and also FLEXIBILITY. the argument work-life balance is a false choice is shown in the ghost of the term “work-life”. Because should it even be a struggle to balance? Life is life. Life includes everything including work. Life is a super set. Work is a subset of life. Thus, logically speaking, balancing the 2 is meaningless. The question is, why we let work takes majority of the % of our life? Conversely, why do we work? And this why, for each person individually, is the problem why they let work consume life. But knowing this why, is also the solution. Flexible work schedules — shifted hours (like mine), telecommuting, part-time work, etc., is one of the most important investments companies can make in their employees. I feel very loyal to my company for allowing me this fantastic schedule. I spent most of my 20s and 30s working way too many hours for too little pay. I was lucky to see my kids during the week, because they were usually in bed by the time I got home. Now, I have the best job of my career. I get paid well, I have a short commute and I have plenty of spare time at work. My dream is to be self-employed, but I don't want to go back to the long hours. Ya making money is a tough task. For that we have to work and make life balance ,But every thing does not go right all the time .it's difficult to make life balance .As we have same routine so it's not possible to make make work life – balance . I think the key is to focus on design, not balance. Designing life with all it's component parts and then looking for ways to turn that into reality is a lot more likely to give fulfillment than the obsession we seem to have created with focussing on balance. If we design our lives around what is most imporatnt to us, based on our core values we will be lviing our lives on our own terms, by design. The key to this is creating our success definition to ensure we are striving for living our bets life, not someone elses or society's.